There's something about the speed and energy of the last months of the years. It starts with that pre-thanksgiving energy, which turns into black Friday shopping, which turns to Chrismas parties and non-stop action. Then comes New Year's Eve and New Year's Day. I often struggle with the best way to entertain myself (and family/loved ones). At this point in the holiday hooplah, I'm over-entertained, over-socialized, and definitely over-fed. Maybe I should be more excited about a new year, but I live in e present more than the future. I've never been one to set grand goals, so new Year's resolutions are out. And then the reality is that January and February are so cold, so uneventful, and so quiet. It's no wonder we love the Super Bowl so much. Don't here pessimism here. Instead here someone gripping on to every day, carpe diem. It's been a good year, and I trust e next will follow. Happy New Year's to you and your family, whatever your thoughts are on the end of this chapter and the beginning of the next. New to the world of iPhone land (and now iPad world) in a sea of apps, there are definitely busts and winners. One of my favorite applications that I have found and love in both the iPhone and iPad version is flipboard. I started using Flipboard on my phone a few weeks ago, and now when I received an iPad for a gift, quickly put it on the iPad (the format it was initially designed for). The app takes information from social media (including your own twitter/facebook feeds, as well as scrolling through categories, apparently adjusting content by what you view, retweet, etc). Praise for the app is old news (it was apple's app of the year in 2010), and it's been a favorite - not to mention, as you will see in the example above with my RSS feed on flipboard, everything looks beautiful, crisp & clean. One of the unique things about this holiday film line up is a unique alignment of film themes/motifs in the role of keys and deceased fathers. Two films are so different but both carry this concept. In Extremely Loud and Incredibly Close, the main character, Oskar, has a key that he believes if he finds out what it opens will help connect him to a message from his father. In Hugo, the title character, has a machine (needing a key) that he believes if he can make work (with the key) will help connect him to a message from his father. In both cases, the young men where deeply connected to their fathers and forced to deal with sudden tragic death. Yet, I expect that the power of these themes is not the tragedy of the deaths, but instead a social trend that resonates with many. I believe there are many men (young and old) who feel as though they are missing a piece of their father. This father disconnect could be for a variety of reasons, but I believe that at some level many people are looking for a better understanding of who their father's where/are, and more so, how that relationship fits into their life, destiny, future. (Feel free to add Midnight in Paris or War Horse, and take out a film or two, such as Hugo). And let's say momentum continues to rest with The Artist as the favorite to win. But unless there is a strange shift in movie viewership and fan support I don't see this year's Award season having much cultural interest. The highest grossing film will be The Help (assuming it's nominated) and that summer film really got a box office lift from the success of it's source material, the novel by Kathryn Stockett. 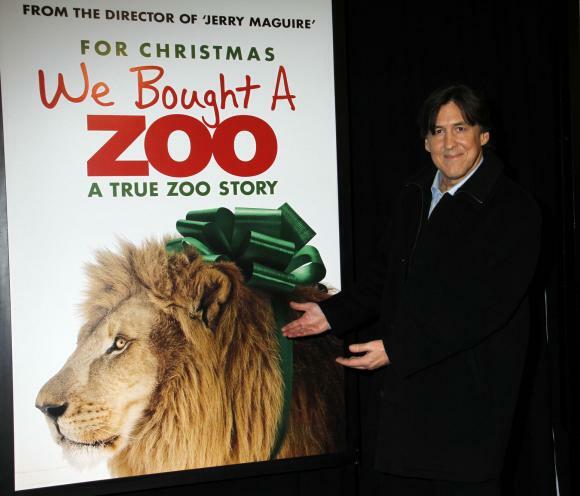 In related news you have nights that Univision wins in TV ratings and it's been an awful December at the boxoffice. It would seem that American entertainment is at a cross roads where it's best product is often miles away from it's audience. An audience I believe who's willing to engage, pay money, and be entertained. Bill Cunningham New York is one of the 15 films shortlisted for an Academy Award nomination in the feature length documentary category. The film directed by Richard Press, tries to capture the essence of Bill Cunningham, the New York time fashion photographer known for his street shots. 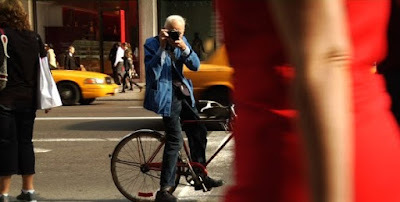 The film explores Bill Cunningham's vast perspective and appreciation for practical and evolving fashion, with involvement at runway shows (only taking pictures of clothes he finds truly original, with a non-conventional seat to get different shot angles), street shots (capturing trends, never making an "in" and "out" list) and shooting at society events (choosing on his own which philanthropies are most worth of attention, not basing decisions off the guest list). The film is pretty engaging, simply because Bill Cunningham himself is such unique person, with a unique perspective, and a unique passion. Apart from his passion itself, it is also enjoyable to see a man in his 80s still in love with his job, working hard to do it every day. Richard Press in his directing seems to set his goal on capturing who Bill Cunningham is, including his own personal life story, and while he asks some very candid questions regarding religion and Cunningham's sexuality, these scenes reveal little while creating some awkward film moments. In the end you know little about Cunningham besides his zeal for fashion photography, but you also end up wondering if that's the sum of Cunningham. Another side bar to this story in this film is the time period of filming also captures the displacement of Cunningham from the Carnegie Artist Studios. The film captures the simplicity of a simple man, in a culture of high fashion and being New York to-dos and in watching the film you can see how Cunningham's respect from the community is deserved. He's a unique voice who documents his story riding a bike, with a camera, an eye towards fashion trends, and respect for his subjects. By the time a news story strikes and involves someone taking any type of radical action the context for how the individuals and organizations involved conceived that their idea was remotely a good idea. 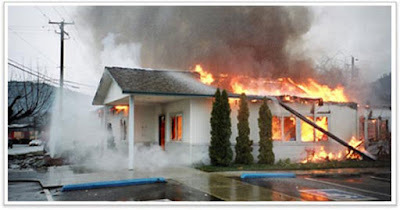 Such is the case with the radical environmentalist in the earth liberation front who have been characterized by doing significant damage to corporations primarily through arson and other forms of vandalism. The document If A Tree Falls: A Story of the Earth Liberation Front, the film follows Daniel McGowan while on house arrest as he's pending a court case after a multi-state FBI investigation is able to pin Daniel to many serious arson crimes, primarily in Oregon. In terms of the movement, the films presentation of the Earth Liberation Front was a story tracking the evolution of how environmentally conscious teens when from letter writing campaigns, to protest, to non-violent resistance, to criminal action. The film makers (Marshall Curry and Sam Cullman) are given a gift in the trial and exposure of the secret cell. In terms of the principle film character, Daniel, the question wasn't whether Daniel was guilty of criminal activity, but rather whether he should be viewed as a terrorist, and questioning what the appropriate punishment was for an activist who's criminal days seemed behind him, who in addition to serious jail time is also be prosecuted as a terrorist. Finally, I think for me personally, the lingering question I ask is questioning social change. Particularly how protest fits in a world where political influence seems to be weakening, public outrage is easily splintered into a wide variety of camps, and corporations make decisions based on income verses democratic principles. If A Tree Falls... is one of the 15 films listed for this years Academy Award nomination for documentary. We recently received a Christian Bookstore advertisement with their Christmas sale items. One page was dedicated to new DVDs on sale. A photo of a portion of that featured movie page is below. I hadn't heard of any of these films before. But I quickly noticed a surprise theme - death of children. For whatever reason, the death of children film apparently is a formulamatic Christian film device. Whether it's a dramatic moment from which a film maker can portray Christian virtues of grace and forgiveness. Of these four films, the only one not dealing with the theme of childhood death is The Shunning about a woman in Amish country, but having not seen the film, it's hard to say if there's a subtly of this same theme, as the main character's past includes secretly giving up a child to adoption. The other three films on the page all begin with unique sentences in the item description drawing out these themes. The ads opening sentence description: Suffering from the loss of his only child, Stanley has isolated himself from his friends and his wife Lisa. The ads opening sentence description: When 15-year-old Luke is killed in a tragic accident, his close-knit family is devastated. The ads opening sentence description: When Mac McDonald loses his son in an accident, the ensuing 17 years of bitterness and pain erodes his love for his family and leaves him angry with God. You would have hoped that when laying out this advertisement that the designer (or product marketing teams) would have noticed this trend. But then again, perhaps the trend is not an accident, perhaps this is a topic common amongst the shaping "family-friendly Christian film genre." It's not just Christian films that explore the concept of the death of children. With the release of Rabbit Hole last year, I did a post of other films that explored the topic of the death of children. Although, I would suspect that these films (which I have not seen) bring a different perspective then their mainstream counterparts. 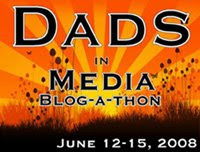 Further, where the mainstream counterparts often have a critical attraction, they rarely have a high box office appeal, and assuming Christian film makers are going for viewers over critical accolades, you would think that the heavy handed subject matter of the death of children would not be the inspiration for films of hope, victory, and meaning. I'm not sure these are the films that Christians want, but rather the types of films that Christian film makers and writing, directing and producing. 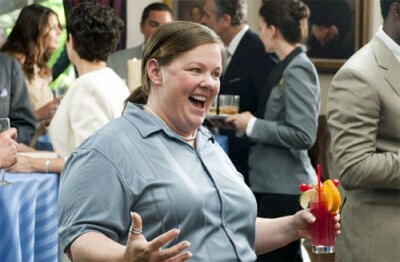 In August of this year Melissa McCarthy received her first nomination for her outlandish performance as the foul and awkward character Megan in Bridesmaid. That nomination was for "Female Scene Stealer" at the 2011 Teen Choice Awards. And the Teen Choice Awards, McCarthy lost (if you can count it as loosing) to Ashley Greene for her role in Twilight Saga: Eclipse. Yet, that wasn't McCarthy's last award. Suddenly the critics groups are coming out today in high praise for McCarthy's work in Bridesmaid this year, being out awarded by expected favorites including Jessica Chastain (for any of her 6 movies), Octavia Spenser (The Help), Carey Mulligan (Shame), Bérénice Bejo (The Artist), Vanessa Redgrave (Coriolanus), Judy Greer or Shailene Woodley (The Descendants), or Sandra Bullock (Extremely Loud and Incredibly Close). It's hard to tell whether McCarthy will ride this out to her first Oscar nomination, but it looks like the critics groups are all drinking from the same wedding punch bowl. These two wins came as a surprise and it'll be interesting to see how this continues as the awards and precursors continue on through the weeks ahead. 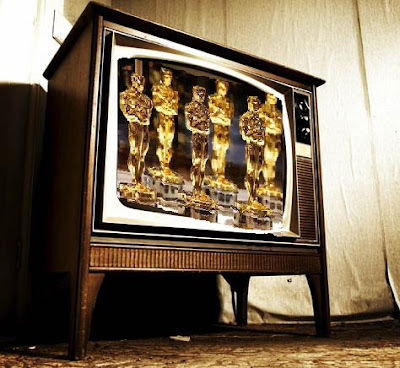 (The LA Film critics did select Jessica Chastain for all 6 films, with runner-up Janet McTeer for Albert Nobbs; The New York Film Critics Circle awarded Jessica Chastain for 3 of her 6 films; The Washington DC film critics nominated McCarthy, but gave the award to Octavia Spencer). 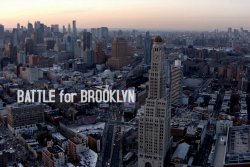 Battle for Brooklyn, one of the 15 documentaries shortlisted for this year's Oscar nomination, is a fascinating story spanning five years in the life of activist Daniel Goldstein. Goldstein finds himself a significant cog in a fight to stop/change a controversial redevelopment project. 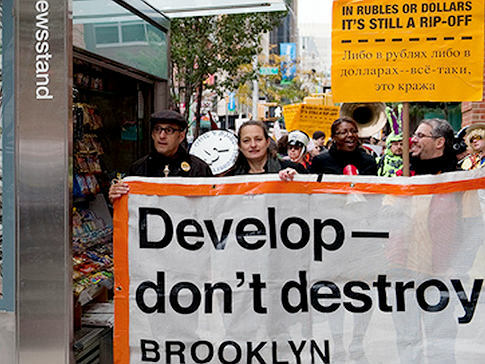 The project at the center of this documentary is the Atlantic Yards development. At the center of the Atlantic Yards project is the construction of Barclays Center where the New Jersey Nets are to relocate in time for the 2012-2013 season when they are to become the Brooklyn Nets. The project, which is more than Barclay Center but a broader redevelopment which includes street changes, residential and retail space, transportation and parking. As a result, this also meant significant government cooperation, and ultimately a plan to use eminent domain law to take over the area. 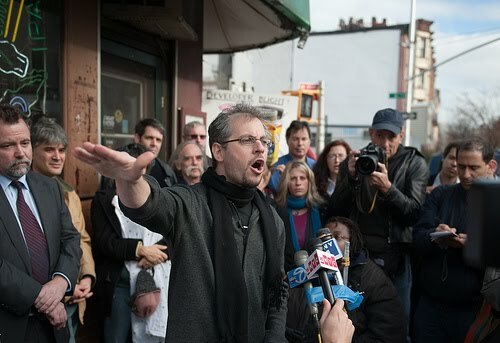 This is where much of the focus of the expose is based - eminent domain abuse where by a private company (Forest City Enterprise's New York subsidiary Forest City Ratner) will gain a financial advantage from a government decree that the area is blighted and able to be destroyed, and residents evicted for a public good. Now, it seems that in general most residents except the deal - except for Daniel Goldstein who picks up a fight that leads him down a path of being a spokesman and challenge to the project. The film paints Goldstein as an unlikely activist, and maybe that is the case, but Goldstein certainly has some traits that seem to make him dedicated to a cause, with a great deal of personal sacrifice, which for this viewer, left him wondering if his cause was truly worth it. 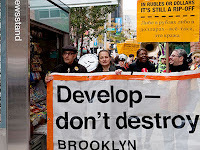 Beyond the eminent domain abuse, the other controversy in the film, is simply whether the Brooklyn Net's project, including the Atlantic Yards Development is really what Brooklyn residents are interested in, and whether they are interested in the change this will bring to their city. What ends up being a point of disgust in the film is when there is a presentation of manipulation on the part of Forest City Ratner by funding a non-profit (BUILD) and working behind the scenes on a community cooperative plan, that misrepresents neighborhood interest. Related to this, I was disappointed to see Brooklyn religious leaders used as pawns to lead community meetings that in the end it seems these religious leaders community pull was bought at a price, and are speaking out of motivation apart from their religious convictions. Ultimately, apart from the story of this documentary, the directors Michael Galinsky and Suki Hawley do an exceptional job telling this story, keeping it moving with great momentum and capturing a story that uniqueness is in part for the way the story is documented over many years with unexpected influences in the developing story such as a changing economic landscape. Also, the original music by Derek Bermel and David Reid was a fantastic addition. Real-estate development seems to be interesting in most situations when you see a place change over time from one state to another, and when that real-estate development is in Brooklyn, New York, you can only expect it to be all the more interesting, and I'm sure years from now when the project is further developed, a film of this nature helps capture how an area got from point A to point B. This film helps capture the details, some of those, not so glamorous. One of the unique things about the film The Descendants is that it takes place in Hawaii. This unique setting is not an add on (as in...the story has to take place somewhere, and we kind of want to have a tropical beach climate, how about Hawaii. Instead, Hawaii is a part of the story, and placing the film somewhere else takes away not only from the plot, but also the general texture ingrained deep in the film. I was trying to think of other films that take place in Hawaii, and the list of films is limited. You have your world WWII Pearl Harbor stories (new and old, including Pearl Harbor, In Harms Way and From Here to Eternity) and tropical comedies (50 First Dates, Forgetting Sarah Marshall, Just Go With It). And of course, there is tropical adventure which take advantage of the secluded setting (Six Days Seven Nights). Plus, there's a Hawaiian kids film (Lilo & Stitch), surf films (Blue Crush), and potentially the worst film of last decade The Big Bounce. And how can I forget in the list of films the film Hawaii based on the James Michener book. And so, in thanking about the list of films, The Descendants is unique in the fact that it's a contemporary drama - no surfing, no airplanes bombing military bases, and no Romantic beach flings. And I think it's a detail like this that makes a film like The Descendants stick out - it's not the only thing, but I think it's something worth appreciating in this film. 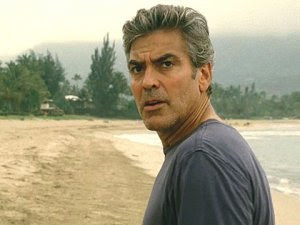 One of the reasons people will continue to talk about George Clooney's performance in the film The Descendants, is not just because of Clooney's Hollywood swagger. 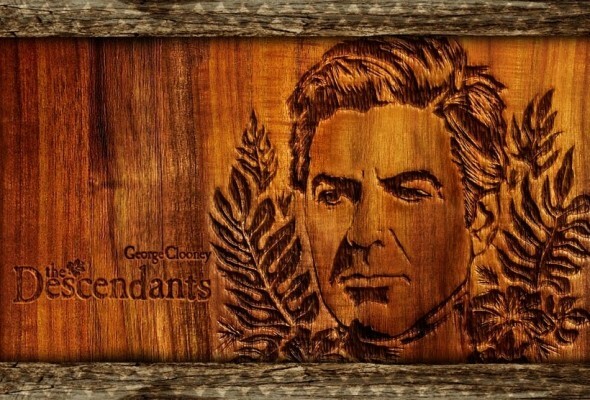 The role of Matt King in The Descendants is a unique gem of a performance, and Clooney nails the performance. Matt King is one of my favorite characters in cinema that I have seen in awhile, and it's as much for what he doesn't say and doesn't do, versus what he says and does. 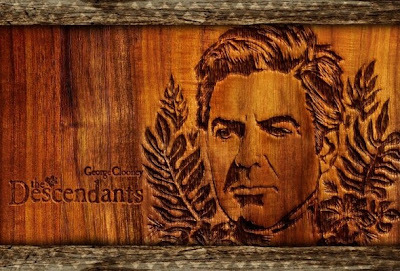 There is a subtleness to King, that Clooney is able to portray. I have to imagine that the novel for which the film is adapted, that King has this same subtlety, but somehow the words not spoken are easier to see in books sometimes than in film. There are a number of scenes in this film from the beginning to the end where you can tell that King shows restraint, or is pondering two options for what he could communicate. I think of the scene's with his youngest daughter (Scottie King played by Amara Miller) when he holds back sharing sad or demeaning information about her mother's health or character. Similar restraint comes through in interactions with Matt's father-in-law (Scott Thorson played by Robert Forster), particularly at the end when his father makes some comments about his daughter's character that Matt could easily dismantle with his recent revelations. Yet he does not. The times when King is loud and boisterous are limited (such as a scene when he is alone with his wife in the hospital, or with his wife's best friend Kai). Matt King, although obviously having his own failings in allowing his work to displace his family, is able to still exhibit wisdom and make good decisions. In the midst of chaos, Matt King's keeps his head. He could go off the deep end and discredit himself, or even dishonor his wife, but instead he let's truth work itself out, and makes the best decisions that he personally can make, rather than depending on other's to make the right choice. Instead of blaming others he makes the best choices he can, and allows an awful situation to still have it's own redemption. 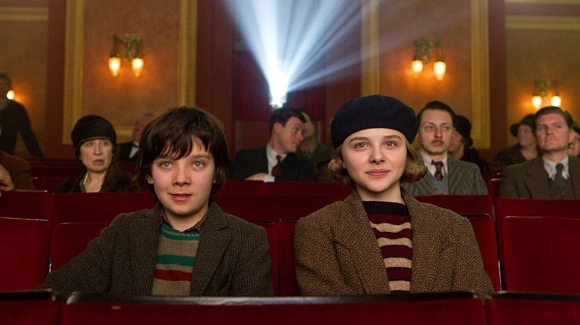 This is a big boost to Hugo, a film, that while being a "kid's film" has long been suspected to be a contender in this year's awards. The NBR helped confirm that with the wins for the film and Scorsese as best director.